Packed full with jojoba beads and seaweed to refresh and clarify, your face will feel super-soft and beautifully clean with every use. Refine your pores whilst deeply cleansing your skin, with our facial polish. 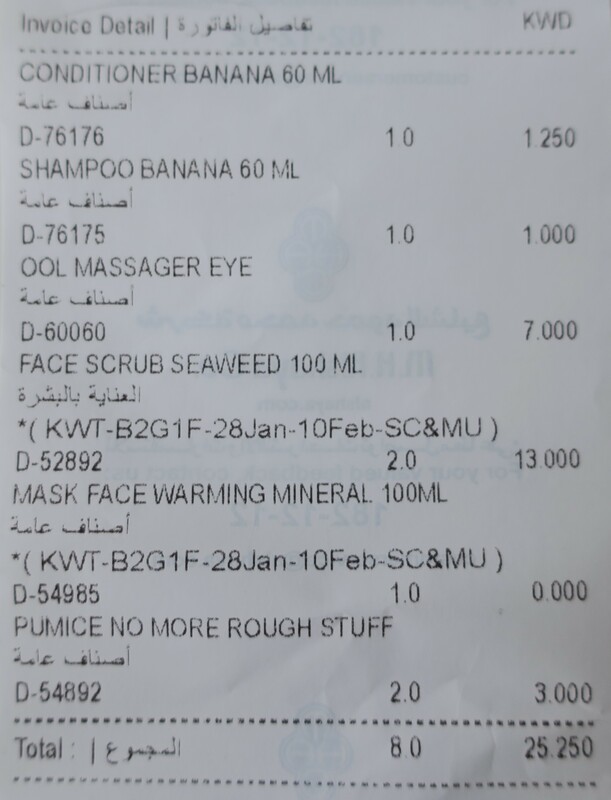 Seaweed Pore-Cleansing Exfoliator (x2) retail for KD 6/500 each and Mineral & Ginger Warming Clay Mask retails for KD 6/000 so it ended up being free (since it cost the least). 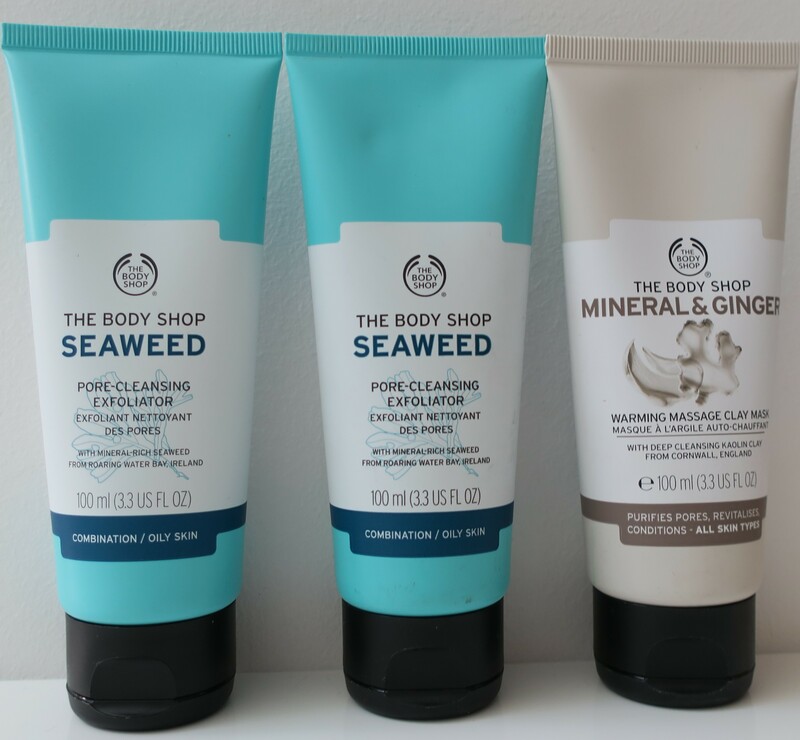 I’ve purchased the Seaweed Pore-Cleansing Exfoliator in the past (haulage here) and consequentially fallen in love (and ended up using it all up quite quickly), hence the repurchase of not one, but two more! 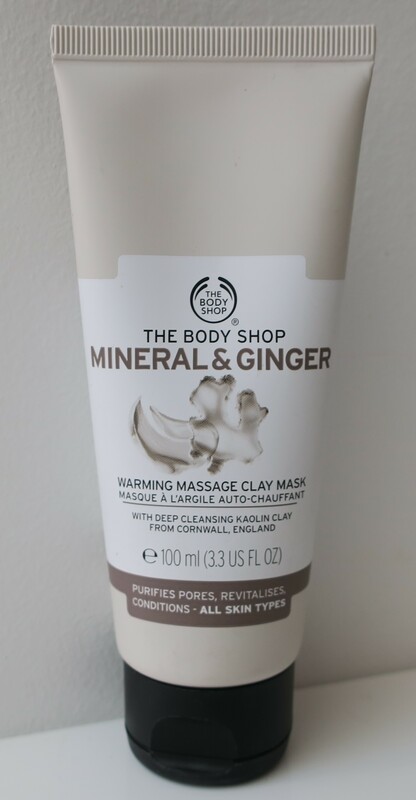 I could’ve just picked up three, but I wanted to try out something new and different and the Mineral & Ginger Warming Clay Mask seemed quite enticing! This cleansing mask for all skin types warms on contact with wet skin. It leaves skin clean and revitalised. Honestly, what with all my GlamGlow stuff, I have yet to start using this Mask. The packaging is very blah and unappealing but this stuff is marketed as a Warming Mask, which I think is the coolest (heehee)! I enjoy playing around with cooling/warming products and this stuff is no different. Plus, it contains Ginger, which is sorta’ like the Origins GinZing range (haulage here) down to the whole self-heating thing. 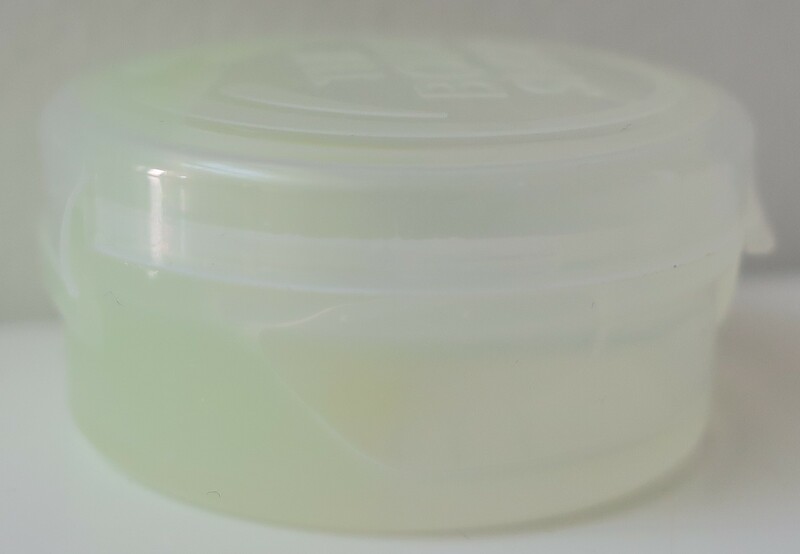 Lastly, it’s a Clay Mask which is not only handy (with oil-absorption and such… even though my skin is as dry as the Sahara lawl) but also fun (pretend you’re at a Spa), if nothing else! Enhance the experience of our Intensely Revitalising Eye Cream-Gel with our NEW Precision Eye Massager. Its targeted design helps you apply with the spatula end and massage with the rollerball. Follow the Flick and Twist Eye Massage Technique for best results. I was quite charmed by the idea of applying an Eye Cream using this little Tool. There were two different versions of this thing; one had 2 er… balls and this one which had 1 ball. This one seemed more simple and honestly looked more sleek, so I went with it instead. As you can see, the round metallic ball attaches to the white wand using magic a magnet, which is pretty cool! 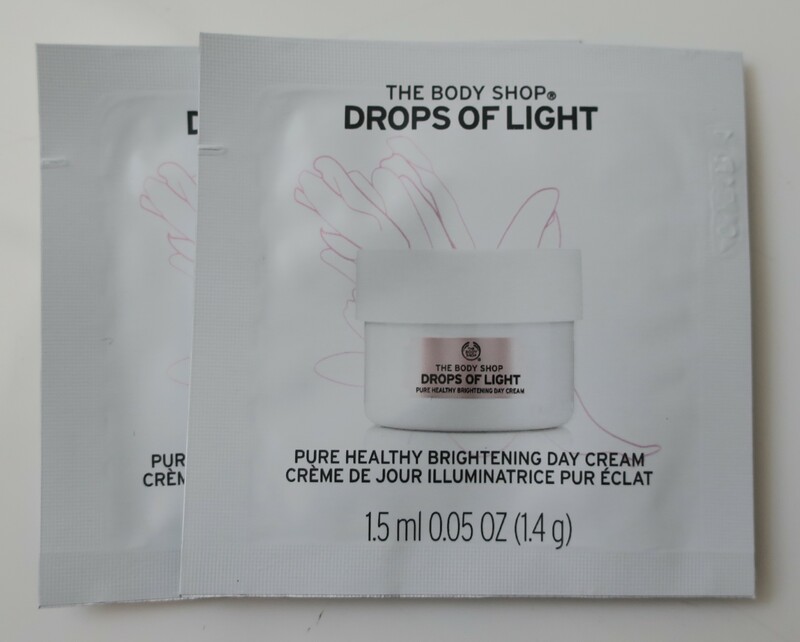 I absolutely hate my current Eye Cream (hauled here) so I asked for a sample of the Drops of Youth – Youth Bouncy Eye Mask, both of which happen to be from The Body Shop, to test out with this baby. Even if this Precision Eye Massager doesn’t really do anything, it still feels like you’re doing something beneficial for your under-eye area regardless, so there’s something to be said about the Placebo Effect. Enriched with deliciously ripe Community Trade banana puree from Ecuador, this truly nourishing organic shampoo gently cleans your hair leaving it soft, smooth and drenched in an uplifting, tropical scent. Enriched with deliciously ripe Community Trade organic banana puree from Ecuador, this delightfully fragrant conditioner deeply nourishes hair and leaves it feeling softer, looking shinier and infused with a tropical scent. 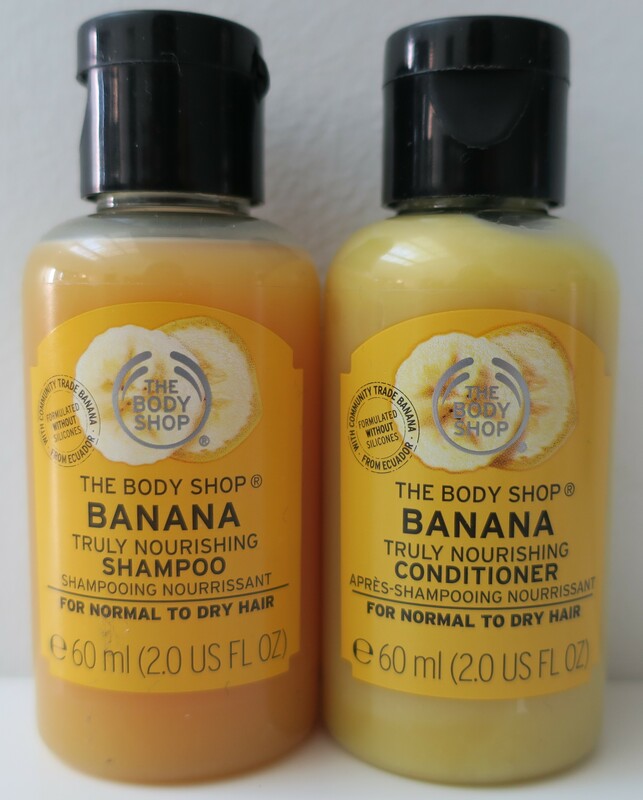 I’ve actually purchased a full-size of the Banana Shampoo as a teenager and loved it! I’m so glad they’ve brought these back! Honestly, I can’t tell if they’re actually doing anything beneficial to my hair (other than their basic functions which is to cleanse and condition) but I find the scent on these babies to be absolutely delightful! 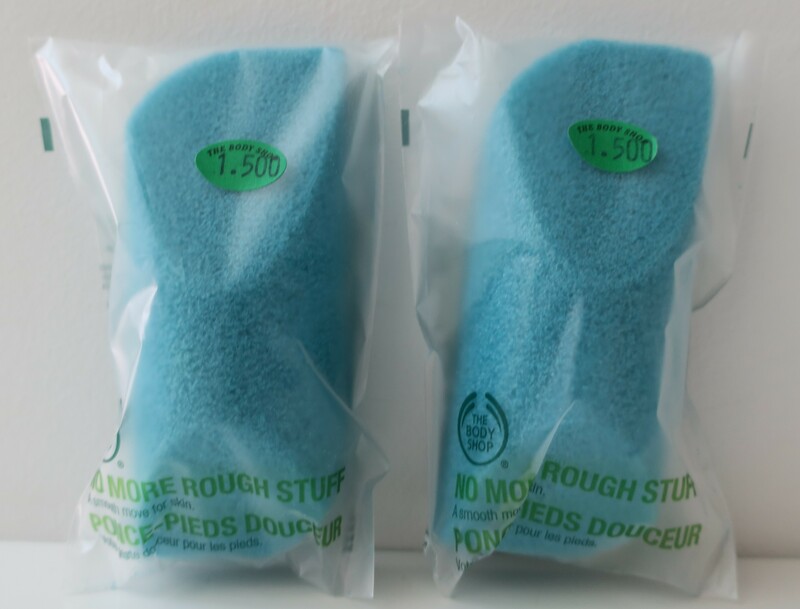 No More Rough Stuff Pumice (x2) retail for KD 1/500 each. Buff your way to beautifully soft skin, with our effective No More Rough Stuff Pumice. Use on your elbows, knees and feet for skin that’s smooth to the touch. The main reason I was in The Body Shop in the first place was to pick up another one of these babies. I’ve actually looked for them all over the country (Avenues, Marina Mall, etc…) and could never find them at any of those other locations. I knew I could depend on good ol’ trusty Souk Sharq! Since these were so inexpensive and so hard to find, I decided to get 2 so I wouldn’t get stuck in that same situation again. I love using the No More Rought Stuff Pumice in conjunction with the Peppermint Foot Scrub (haulage here). After a long hard day of work, the Peppermint Foot Scrub paired with the No More Rough Stuff Pumice feels damn near euphoric! Enriched with cucumber extract and plant stem cells, our Youth Bouncy Eye Mask can be applied to instantly give tired eyes a powernap*, or used as an overnight mask to wake up with skin that looks younger and feels healthier. This refreshing, non-sticky formula helps address the first signs of ageing to help skin bounce back to a more youthful appearance. Truthfully, I like the fun name (Bouncy Eye Mask!) 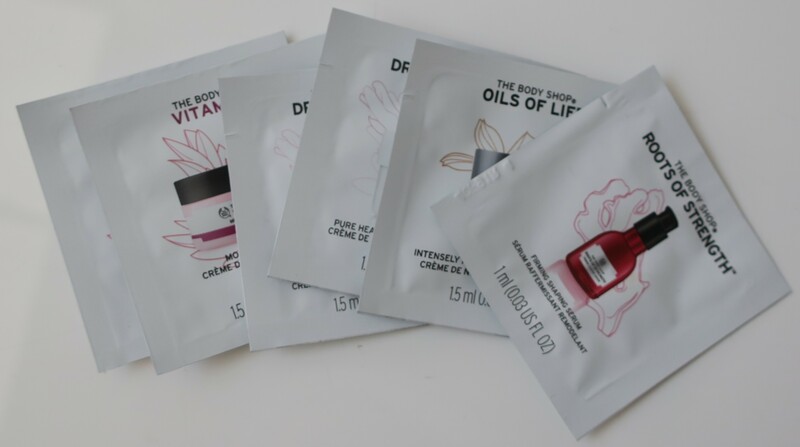 of this product and the packaging looks pretty appealing as well which is why I asked for a sample of this stuff (to be used with the Precision Eye Massager). If things go well, I’m definitely gonna’ spring for the full size. With a lightweight silky texture, this firming and shaping* serum leaves skin feeling smoother and refined. 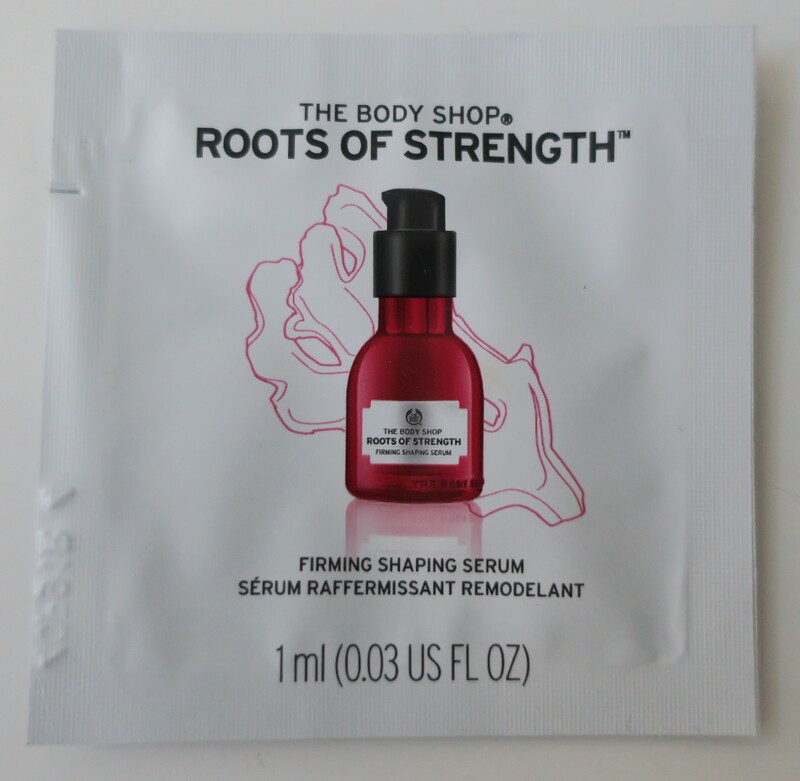 Taking inspiration from nature, the formula is infused with three root extracts, including ginger from Madagascar. Wrinkles appear less visible and signs of ageing reduced. From your jawline to every contour, skin feels moisturized, smoother, plumper and firmer, as if re-shaped. Use daily as part of your three step Roots of Strength™ regime. 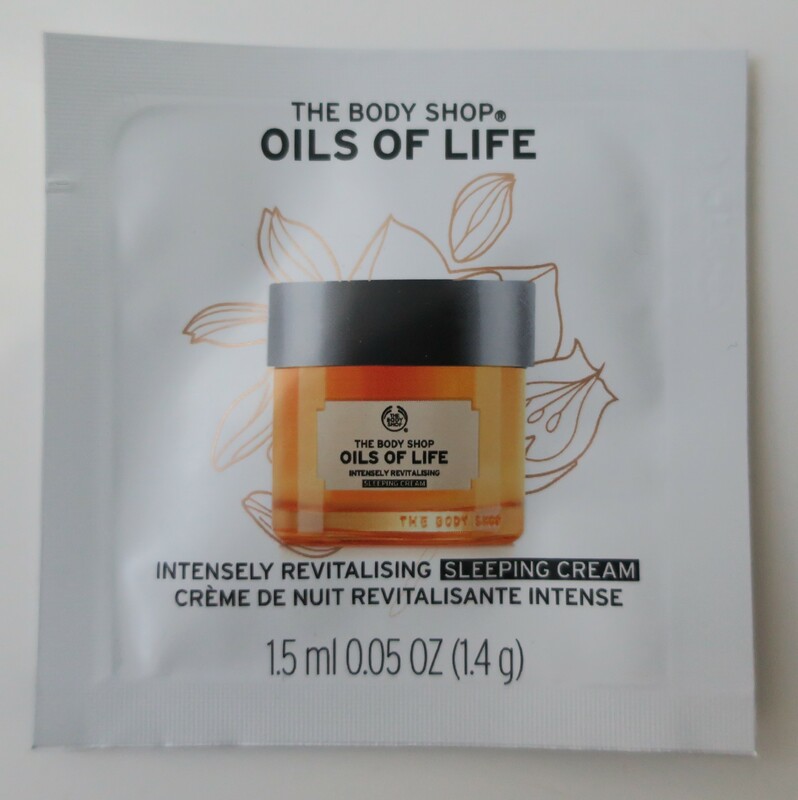 This nourishing night time cream, infused with three precious seed oils from around the world, moisturizes whilst you sleep. 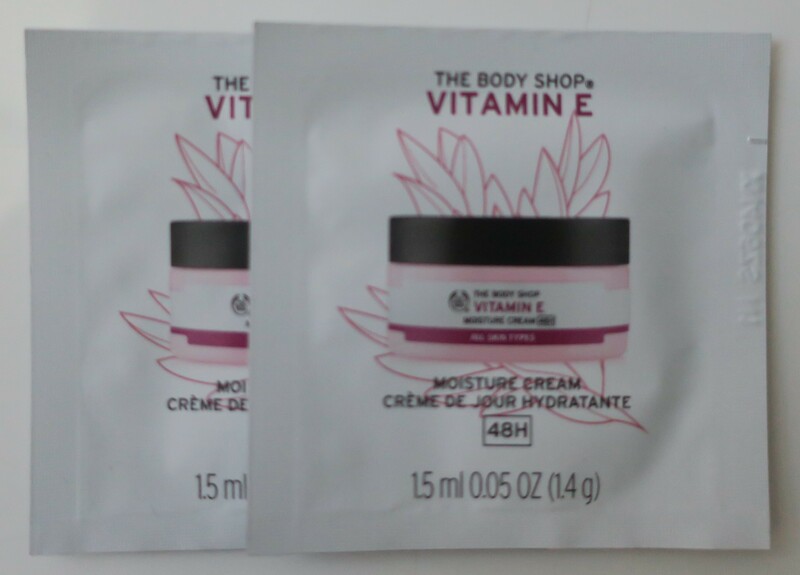 Waking up, skin looks rested and revitalized, feels velvety-soft and more supple. 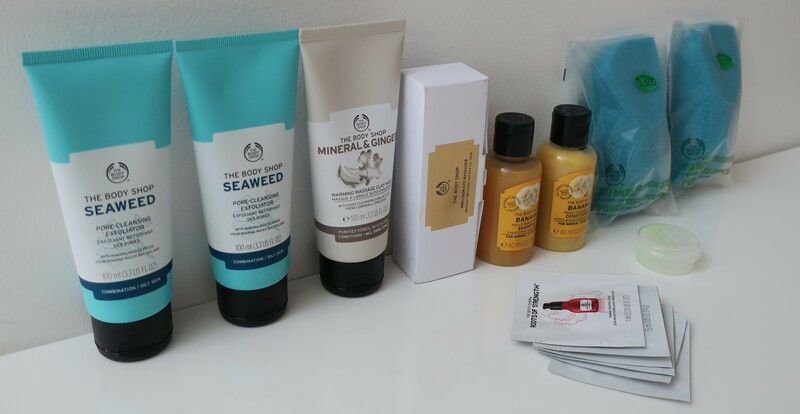 Unlike the other branches, the Souk Sharq branch of The Body Shop were pretty generous with samples!